Healthy and energized employees are your biggest asset. 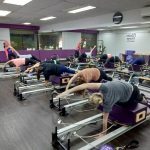 At Pilates Fitness, we pride ourselves for providing effective and customized Pilates programs for individuals at all fitness levels and age groups. We are sure that your company shares the same goal as us – one that encourages employees to stay healthy, fit and energized with increased productivity as well as to reduce your healthcare costs. The Pilates Fitness Workplace Health Program makes it easy for companies of all sizes to implement Wellness @ Work. Companies like SingTel, Temasek Holdings, Apple Singapore, NUSS, ExxonMobil and others have benefited from our program, what is keeping you from partnering us? Pilates is a proven mind-body exercise and an excellent stress buster. It relieves tension, reduces body aches and tones up the body. A pain free and energized body will increase productivity and morale. A study of Singapore-based businesses by the Singapore National Employers Federation has shown that for every dollar invested in Workplace Health Program, companies reaped an average return of $1.68! Also, with almost 50% of your employees’ waking hours spent on the job, they are more likely respond to a company affiliated Corporate Fitness Program. Action speaks louder than words. A Workplace Health Program demonstrates a commitment to your employees and shows a concern for their health and fitness. You don’t have to be a major corporation to provide a corporate fitness program. Companies of any size can make an affordable investment in employee health at the workplace. Pilates Fitness works with you to implement NO COST Workplace Health Program your employees can enjoy the same quality service at a lower rate. We provide marketing, registration, payment and other administrative support so that it is easy for you to kick start your Workplace Health Program. We are the first and only Pilates Studio in Singapore and Asia to provide effective lifestyle based Pilates Reformer classes. Our classes are meant to resolve certain lifestyle woes so that benefits can be experienced in a short period of time. Some issues that we address are weight loss, body aches, issues caused by slipped disc, scoliosis, sciatica, frozen shoulders, tension migraines and other physical injuries. We provide customised workouts for each individual in a group class setting. This means that they are constantly challenged as they experience different workouts in every Pilates class. Our last class on weekdays starts as late as 8.30pm to cater to busy executives. We are open on public holidays except for Christmas, New Year and Chinese New Year. There is no excuse for not doing a Pilates class! We engage only full time Pilates Instructors in our Pilates studio so that our Pilates Instructors are committed to the growth and development of your employees. This is also the reason why our clients see fast results and continue to stay with us. 3. Promote the Program & Reap the Results! Join the list of companies who have partnered us and start promoting a healthy workplace today!